We Mean Business > 32 D I V E R S I T Y W O M A N Fa l l 2 0 1 8 d i v e r s i t y w o m a n . c o m know, but we must do the necessary inner work. "We may not be ready to make the necessary changes, or we may be afraid of the realities associated with the answer, but we know," she explains. Saying "I don't know" removes us from the responsibility that comes with accepting the truth. Tip #2 Start exploring. Everyone is not going to figure it out im- mediately. "I had to accept who I was and acknowledge that I didn't want a life out of balance," says Littlejohn. Next, she had to decide what she wanted—and, just as im- portantly, what she didn't want to do with her time. She began by attending confer- ences and workshops, reading books, and listening to podcasts to start the elimina- tion process. "By engaging with nonlaw- yers at these events, I was able to talk to people who were doing things I wanted to try," she says. e attorney also took per- sonality tests and developed a personal mission statement to get to the core of who she was and her accompanying per- sonality traits. As a result, she stopped ap- plying for contracts or positions that were institutional or slow moving because the data revealed she enjoyed fast-paced set- tings, juggling multiple tasks, and inter- acting in social environments. Tip #3 Dream big. At one point in her life, Darrah Brus- tein, 34, felt lost. She was working as a wholesale fashion rep for a high-end denim brand. Everything was fine until she got laid off three times in three years, between 2006 and 2009. She always wanted to own a company and realized that working for someone else felt riskier than working for herself. When her twin brother, Garrett, approached her with the idea of running a payment-processing company, the stars aligned. "I mapped out my life without reservation," says Brus- tein, cofounder of Equitable Payments, which helps businesses find the best fit for their credit card–processing needs. "I envisioned what I wanted my life to look like in 10 years, writing about health, rela- tionships, travel, business, and finances." Next to each goal, she assigned a dollar value, asking herself, how much would it cost to live this dream? at exercise al- lowed her to determine what she wanted, why she wanted it, and how much it would cost to get there. It helped her to uncover her "why": connecting others to the peo- ple, resources, and ideas that get them closer to their goals. Consequently, she later launched another business, Network Under 40, where young professionals meet up in social spaces to develop lasting relationships. Tip #4 Let go of chasing the company carrot. It took Crystal Y. Davis two years to leave her role as a director at a biotech develop- ment company. "I was on the promotional track and allowed the possibilities of lead- ership roles to overshadow my dream of teaching women to become 'disruptHERs' in the STEM industry by collaborating and promoting one another," says Davis, 47, founder of the Lean Coach, a leadership development company in Atlanta. Once her calling became clear, she focused on basics such as selling, business develop- ment, and networking effectively. She also hired a coach. One useful exercise? "From the 40th floor, we would vision cast on the windows with dry-erase markers," says Davis. "Imagine the image of casting your vision in the sky! I believed my dreams of teaching women how to lead others coura- geously and with authenticity would come true." Her goal is to shift the negative para- digm of disruptive leadership because, as she says, "the world needs our brilliance." Tip #5 Craft your vision. "As you start to formulate what busi- ness and services you will offer, get clear on the mission, values, and vision of the company," advises Donna Miller, presi- dent of C3Workplace in Montclair, New Jersey, which provides space, support, and education to help companies start and grow. To craft your vision, Miller rec- ommends asking yourself the following. • What do I like about what I do? • What don't I like about what I do? • What do I want to do more of? • What do I want to do less of? • What do I want to do differently? Having this conversation with yourself allows you to get comfortable in your own quiet space, trust your intuition, and ex- ecute your "why" over time. Tip #6 Ask your network. For guidance, consider sending ques- tions to family, friends, and colleagues. Brustein saw value in asking for their un- filtered responses. Here's a sampling of what she asked. • What do you see as my key strengths? • What is most distinguishing or unique about me? • What, if anything, is bothersome to you about me? • What do you, or others, rely on me for when the chips are down? • Could you tell me something about myself that I don't already know? From time to time, she still reflects on the replies. While some were inspiring, and others were painful, all were useful. 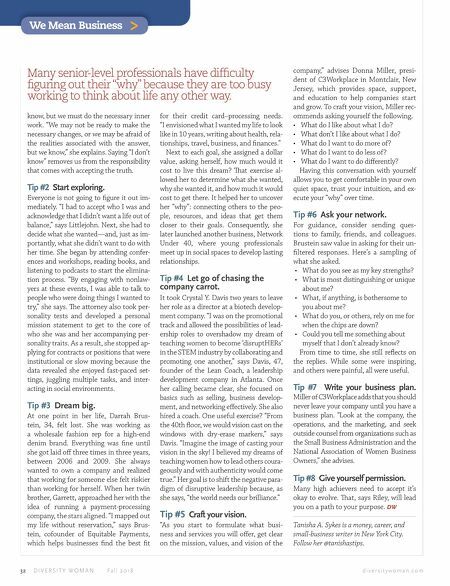 Tip #7 Write your business plan. Miller of C3Workplace adds that you should never leave your company until you have a business plan. 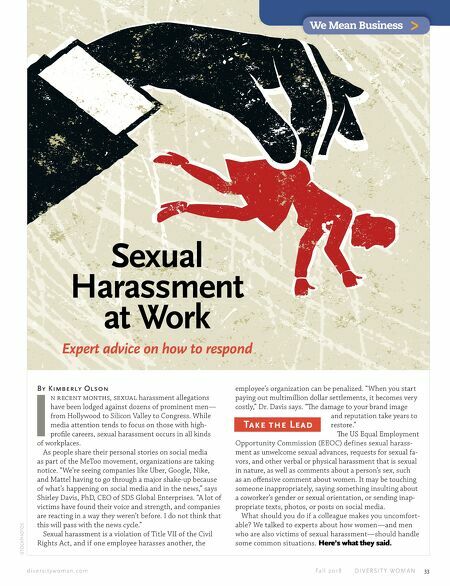 "Look at the company, the operations, and the marketing, and seek outside counsel from organizations such as the Small Business Administration and the National Association of Women Business Owners," she advises. Tip #8 Give yourself permission. Many high achievers need to accept it's okay to evolve. at, says Riley, will lead you on a path to your purpose. DW Tanisha A. Sykes is a money, career, and small-business writer in New York City. Follow her @tanishastips. Many senior-level professionals have difficulty figuring out their "why" because they are too busy working to think about life any other way.